I'm on 4.9.20 and, if anything, the problem has just got worse and worse. Custom built i7-770k with 32GB, 500GB NVME SSD main drive with SATA II HDDs, running Windows 10 Pro (1809), with a 43" 4K display. I've tried running in 1920x1080, running DPP in compatibility mode, and only editing images on the SSD. The program hangs almost every 5 minutes and I need to use the task manager to close it. Often shortcuts like Ctrl-Right arrow stop working as well. At this point, I can hardly edit one image at a time. I like the tools of DPP4, but DPP3 is about 100 times faster and more stable than it. You lack a video card, preferably an NVidia video card. Without a video card, your system RAM is shared for use as video RAM. The CPU and video chip take turns accessing RAM, which slows down the throughput of the CPU. Your very high resolution display is actually working against you, because it consumes more RAM than lower resolution monitors. Most 4K displays are driven by a separate video card, so I am surprised you did not mention one. Up to now, I've been happy with the on-die HD 630 on this machine. I'll swap in a 6GB GTX 1060 from another of my machines and see how that changes performance. So, GTX 1060 installed and GPU acceleration activated - difference, zero. DPP4 still hanging. I tried going back a few versions, but nothing has changed. (right click my computer and select MANAGE) / look for "services and application/services" / search "secondary login" and start it. 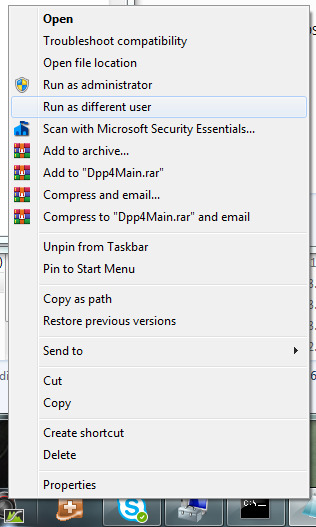 after that you can start DPP as another user (close DPP, after that, shift right click DPP icon), select "run as different user"
now, if I delete files in explorer, DPP doesnt hang. 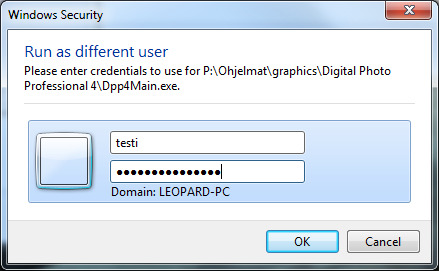 NOTICE, if your images are on c:/user/yourname/... DPP wont see them (that new user doesn't have permissions). this only applies if you have secondary disk where you keep your files. Can I still edit my photos if I don't have permission ? So far it seems to be working. I wonder if this can be used to debug what the issue is. Corrupted profile? Addendum - Amazingly, everything is suddenly faster in DPP with this hack. Changing gamma used to take 15-20 seconds, now it's instantaneous! Yeah, it could be somekind of corruption. but as new user profile doesnt bug(yet). I'm start to look easy way to duplicate userprofile without losing too much stuff. Until then, Im swapping to different user or starting software as another user if I need to edit pics. All my photos for editing are on a second drive. Do you think there is any way I could use your workaround in my case ? That's the ideal situation. The secondary user needs write access to the files.